NISSAN has shown off the livery of the second GT-R NISMO GT3 that will tackle the Liqui-Moly Bathurst 12 Hour this week. 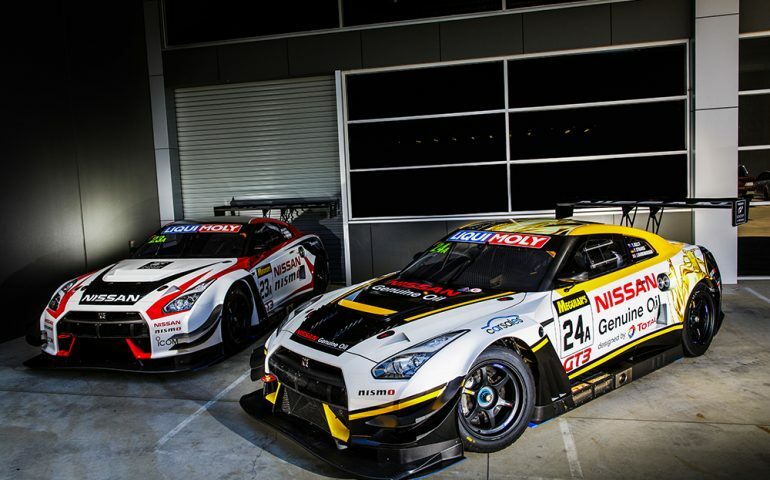 To launch their new brand, Nissan Genuine Oils will be the primary sponsor of the #24 Nissan GT-R NISMO GT3 at the ‘once-around-the-clock’ race at Mount Panorama, Bathurst, with the car driven by Todd Kelly, Jann Mardenborough and former 12 Hour winner Florian Strauss. Nissan and Total have successfully built a global partnership over the years, and Nissan Genuine Oils are the products of this strong partnership and collaboration. “Total has developed a modern, technically advanced lubricant range that meets the specific Nissan requirements across the model range to ensure our Nissan owners have complete confidence in the performance of our vehicles,” said Ian Moreillon, Director customer Experience and Franchise Quality, Nissan Motor company Australia. “We are extremely proud to present the Nissan Genuine Oil, designed by Total, GT-R NISMO GT3 at the 2017 Bathurst 12 hour. Based on Formula 1 technological expertise from Total and co-developed with Nissan engineers, Nissan Genuine Oils are technically-advanced lubricants which are specifically designed by Total to maximize the power and performance of Nissan vehicles, even in the most demanding driving conditions. Every Nissan vehicle has specific engine and overall lubrication requirements. Nissan and Total have developed a complete range of engine and transmission oils, ensuring owners the best performance from their Nissan vehicle. The Nissan Genuine Oil range provides a range of Fully Synthetic and Semi Synthetic products for both petrol and diesel engines, bringing the highest level of lubricant support to Nissan owners. Total has proven its expertise in fuel and oil products for motorsport, producing lubricants for many successful teams globally including Formula 1, Le Mans and World Rally teams. The Nissan Genuine Oils GT-R NISMO GT3 will be one of two factory-entered GT-Rs, with Katsumasa Chiyo, Alex Buncombe and Michael Caruso driving the #23 car.